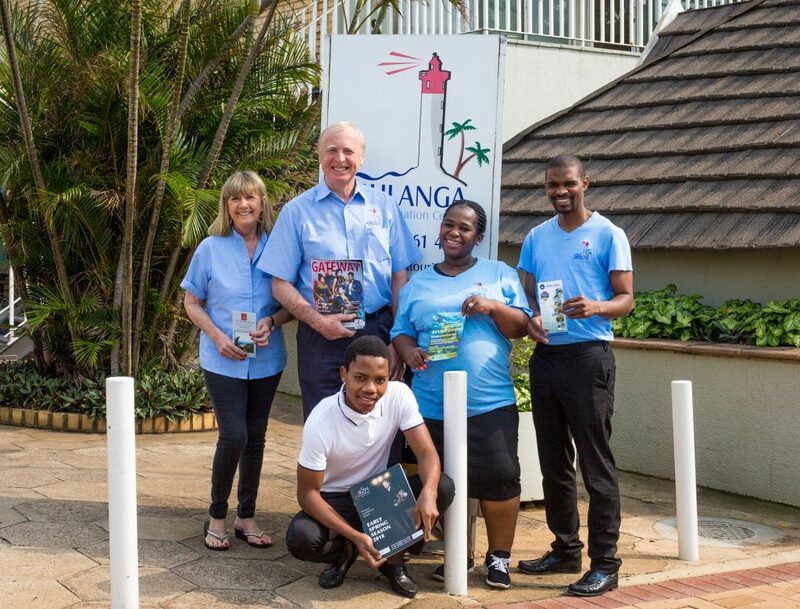 Umhlanga Tourism Information Centre (UTIC) exists to market and promote the northern region of Durban. It operates on behalf of the tourist and the tourism provider and promotes job creation and economic growth. Its geographical area is known as the Umhlanga Coastline – or ‘FunShine Coast’ – and extends from the Umgeni River in the south, to the Tongaat River in the north. Regions include Durban North, Umhlanga, Umdloti, Tongaat, Verulam, Mt Edgecombe, La Mercy and Westbrook. Apart from beautiful beaches visitors will find world-class bed & breakfast venues, guest houses, self-catering apartments, hotels, tour operators, restaurants and more. UTIC was started in 1988 and currently operates from a small building in the bustling hub of Umhlanga Village. Do pop in and meet staff who will help you find information on what to do and where to go. Or simply use our small internet café. Humphrey, Umhlanga’s local, friendly, regularly available pooch is a dog in a million. He belongs to a local pharmacist and makes regular appearances in the village centre. He works hard at raising funds for Durban SPCA and is aiming to raise R1 million for the animal charity. 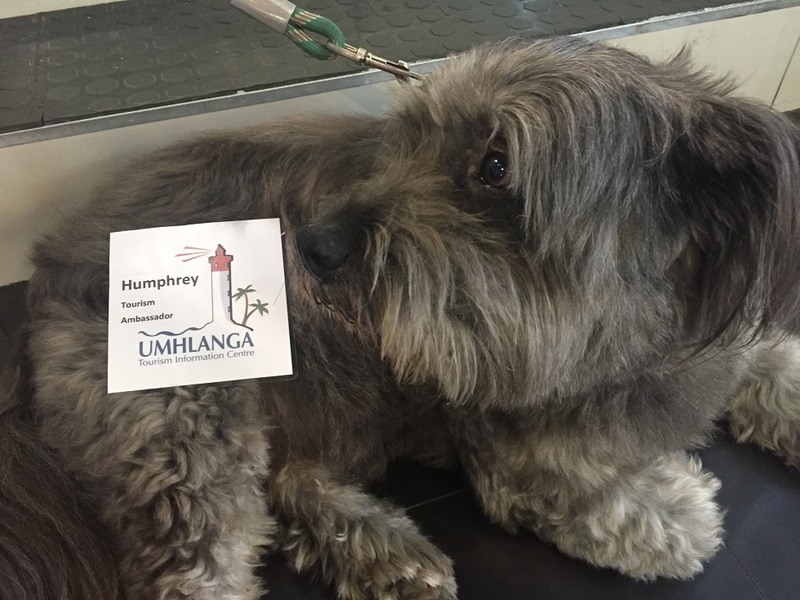 In January 2018 Humphrey became Umhlanga Tourism’s ambassador. Umhlanga is perfectly positioned for any leg of your South African adventure. It is situated 16 kilometres north of the centre of Durban and just ten minutes from the King Shaka Airport. From Umhlanga it’s also an easy three-hour drive north along the superb N2 toll road to the many and varied Zulu Kingdom Game Reserves. If you travel still further north, you’ll reach Swaziland and Mozambique. Alternatively, you can go south on the N2 to Port Shepstone, the holiday resort of Margate and then on to the Wild Coast. Or continue all the way to the Cape Garden Route and ultimately on to Cape Town. For those who want to explore the mountains, head inland on the N3 to the world heritage site of Ukhahlamba Drakensberg Mountain Park. Beyond that you’ll reach Johannesburg, Mpumalanga and the fabulous Kruger National Park. The Durban / Umhlanga coastline enjoys a warm subtropical climate. Winter time (June to August) is wonderful, with temperatures ranging between 12°C at night (no need for air-conditioning) and 23°C at lunch time. Summers are hot and humid, particularly during February and March when temperatures reach 30°C or higher. Sea temperatures vary from 25°C in summer to 20°C in winter, which allows for comfortable year-round swimming. No wet suits required. The average rainfall for the year is in the order of 900mm, with the main precipitation taking place during spring and early summer. Autumn and winter are drier seasons and filled with blue skies and sunny days. Originally home to San hunter-gatherers, the area south of the Tugela River (incorporating present-day Umhlanga) was later occupied by Nguni-speaking people who were unified under King Shaka in the early 1800s into the proud Zulu nation. The area came under British control soon after, becoming part of the large estate belonging to the great sugar magnate, Sir Marshall Campbell, who sailed to South Africa from Glasgow in 1850. Indian indentured labourers were brought in to work on the sugar estates in 1860, bringing with them a vibrant and colourful culture, giving the area its unique multicultural flavour. In 1869, Umhlanga’s first beach cottage was built on a rocky site overlooking the sea. In the true spirit of Umhlanga hospitality tea and scones were served to passers-by from the site. The reflective roof of the cottage was also used as a beacon by passing ships’ captains to navigate safely around Umhlanga’s rocky headland. The cottage was converted into the Oyster Box hotel in the 1950s and around the same time Umhlanga’s distinctive red-and-white lighthouse was built to warn mariners away from the dangers of the rocks. The first hotel in Umhlanga was built in the 1920s by Virginia, daughter of Sir Marshall Campbell. Other hotels soon followed these two and the village of ‘Umhlanga Rocks‘ became the most sought-after area for locals to visit during their holidays. The rest, as they say, is history. The name ‘Umhlanga‘ means ‘place of reeds’ in the Zulu language. Girls & Boys Town, situated in Verulam on the north coast, cares for children aged 10 to 17 who have been placed in care by the Magistrate’s Court. The organisation, which was established in 1958, has embarked on a journey to relaunch, renew and refurbish its programmes and residences. This includes increasing its family-style living facilities. to collect much-needed items for the facility. Non-perishable food items and toiletries, used linens, curtains, crockery, cutlery & furniture are all needed. Contact Umhlanga Tourism, Kwababa or Girls and Boys Town if you would like to donate.